- By bus: the 97 RTM bus line to Hôpital Nord will drop you at the entrance of the campus (Bourrely Dramard or Hôpital Nord stops: first stop after the highway). - By car: take the A7 highway towards Aix en Provence, and get out at exit 32 (Hôpital Nord, Septèmes-Les-Vallons, Saint Antoine). At the first roundabout, take a right and the entrance of the campus is just there, 20 meters on your right. - By bus: the 51 Cartreize line to Marseille Saint Charles will drop you at the entrance of the campus (Bourrely Dramard stop). - By car: take the A7 highway towards Marseille, and get out at exit 32 (Hôpital Nord, Saint Antoine). Follow the signs to Hôpital Nord, the Med School campus is facing the hospital, downhill. Our lab is located on the first and second floors of the C building. C building can be accessed by pedestrians walking through buildings F and E from the main entrance of the campus. 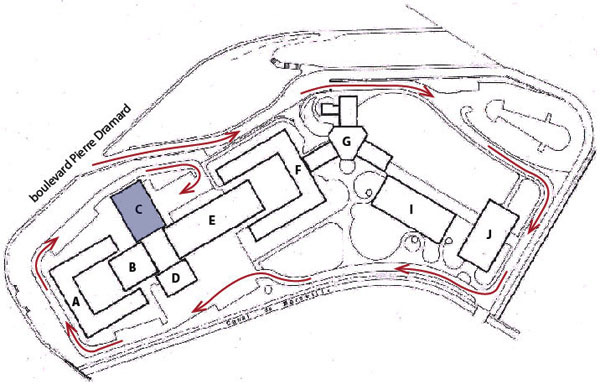 Drivers have to follow the main path around campus until they get to the parking lot in front of the C building.